Yesterday I was helping or hindering Richard, the man hooking up my mother-in-law’s new dryer. After the job was all completed I asked him to help me load the old dryer onto my truck to take it to the dump. I asked where is the Marietta Recycle Center and he gave me verbal directions of how to get there by going down Bells Ferry Road, crossing Cobb Parkway, and taking a right at the second traffic light, next to a restaurant and he named the restaurant. He said it is a chili dog and an order of chili fries. I said I never tried their chili fries and he said I have missed something. I took the dryer to the Marietta Recycle Center and got $14 cash. 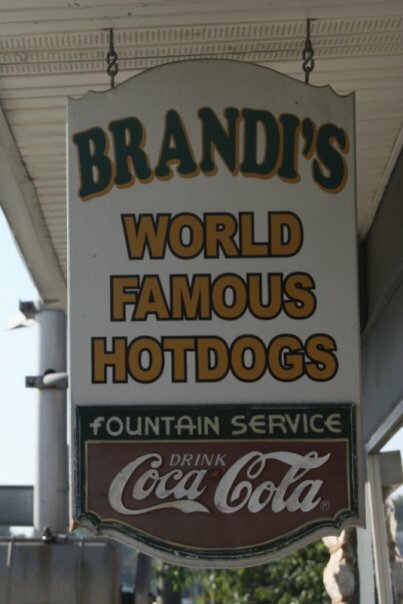 I went to Brandi’s, arriving not long after they opened. Brandi saw me and waved. She knows me. She took my order and I went home to try out a “double dose”. I don’t want to “miss something” as Richard said. The combination of a chili-slaw dog and an order of chili fries is very tasty. Yep, each item complemented the other. 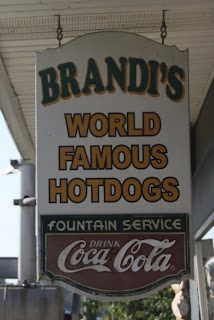 As I was driving home I was thinking I don’t know of an eatery around except Brandi’s that remembers their customers as individuals and the customers remember them the same way. I think that partly has to do with the high rate of turnover in the eating business, they don’t stick around long enough to see repeat customers. On this date, August the 20th, in History . . .
Gobs of Chicken-Fat Galore! WHOOPIE!! !